The tax fraud case against former Baltimore City Police Commissioner Darryl De Sousa has been linked to the corrupt Gun Trace Task Force. 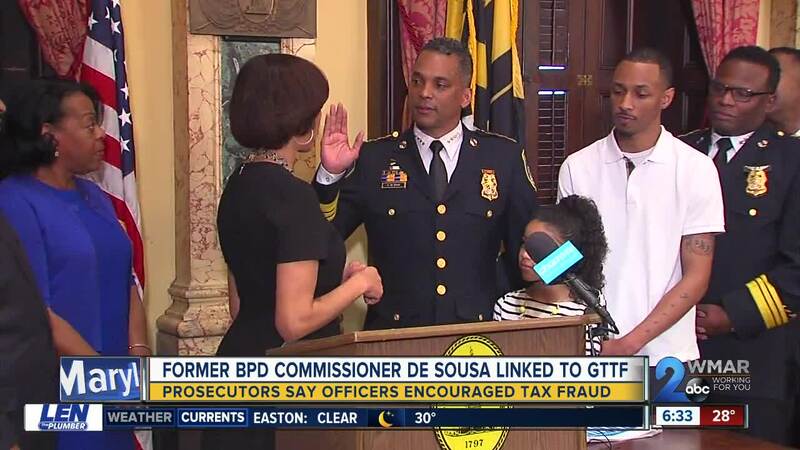 BALTIMORE — The tax fraud case against former Baltimore City Police Commissioner Darryl De Sousa has been linked to the corrupt Gun Trace Task Force. Eight members of that task force are already spending time in federal prison. The same prosecutors who oversaw the GTTF case said the police officers involved in the scandal encouraged Baltimore’s ex-commissioner's tax fraud. A sentencing memorandum said officers shared tips about how to get tax refunds by claiming fraudulent deductions. De Sousa's attorney said co-workers told him how he could save money on taxes but adds De Sousa didn't understand what he was doing. Mayor Catherine Pugh hired De Sousa as police commissioner in January 2018, after she fired his predecessor Kevin Davis. It was only four months later when De Sousa resigned in May after he was charged with not filing his taxes for three years in a row. In December, he pleaded guilty to not filing his taxes in 2013, 2014 and 2015. According to his plea agreement, De Sousa also admitted to falsely claiming allowances on a past W-4 form and false tax deductions on filings from 2008 to 2012. The former Baltimore Police commissioner now owes the United States and state of Maryland more than $60,000 in taxes as restitution. De Sousa is due back in court for sentencing on Friday, March 29th. He faces one year in prison for his tax evasion charges.